I am almost halfway through my preparation to Marian Consecration. I am proud of myself for not missing a single day or reading, reflections, or prayers in the past 14 days. One of the biggest changes I have noticed in my life is a rearranging of my priorities. I have made my prayers a priority, and they haven't been a hassle to get in. A little done in the morning, at lunch, and before bed. I just need a couple minutes each time and then I let myself ponder the rest of the day. I don't have time for long, extended moments of prayer or reading right now in this season of my life, so I am enjoying these nibblets of time I am carving out here and there. I have to thank Mother Mary for helping me find these times and also inspiring me to keep on trucking, even on those stressful days. 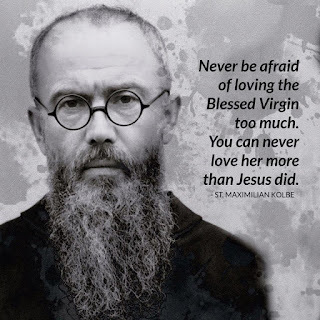 This week I fell in love with St. Kolbe's Marian teaching on the Immaculata. Admittedly, I cannot grasp the theology of the created and uncreated Immaculate Conception and understand that relationship well, but I believe. I have the faith. I have the hope. I have the desire. For me, I think that is what counts the most. The fact that I accept it even if my mind is unable to comprehend the theology St. Kolbe wrote about. 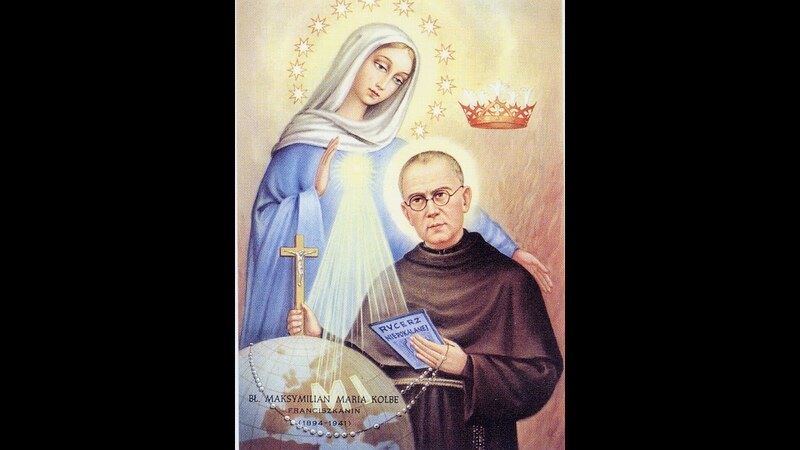 St. Kolbe's zeal for the Immaculata, and his desire to change the world, is inspiring. Could we all do what he did? It seems so huge and unattainable, but his consecration prayer makes it easier. I want to be Mary's instrument, to use as she pleases to extend the kingdom of God in this world. I do not know how far my gifts can go or how she will use them, but she would have a better way to use them than just me on my own. Knowing that I do not posses gifts of knowledge and wisdom are useful here. I am able to have faith and trust like a child easier. It isn't easy for e to put into words what I have learned this week. Instead, it is easier to feel it in my heart. My children are doing a wonderful job of giving me many chances to continue to work on my humility, gentleness, tenderness, and love. As someone once told me, children are like sandpaper, smoothing out all your rough surfaces. Tomorrow I will begin week 3 and study St. Teresa of Calcutta and her teachings. St, Maximilian Kolbe, pray for us.